I hope you enjoyed your visit to The World Boardgaming Championships. WBC is not for everyone, but it IS unique and for those of us who enjoy it, it is not to be missed. I hope you've recovered from your "vacation"...I'm just starting to return to normal, but there's no time to waste. WBC 2011 is only 50 weeks away. On with the show! Bruce Beard retained his title as the longest continuous reigning master at WBC by holding serve to win his sixth straight 18XX title, one of just 24 of the prior champions to successfully defend their title, but 2010 will be remembered as the "Year of the family". In all, five different nuclear families combined to win 20 championship plaques (not Junior wood). Congratulations to the Beyma, Emery, Field, Henning and Reiff clans. In all, players from 43 states and three Canadian provinces plus 12 nations won laurels in WBC tournaments this year. At the other end of the title spectrum, 31 players won their first WBC championship and 85 earned their first laurels. 16 won multiple titles, led by Bruce Reiff who "homered" with three shields in Football Strategy, March Madness and Union Pacific while adding a fourth Trial title in his "lock" event, Battleline, to continue his streak of winning wood every year. He narrowly missed the never achieved WBC Grand Slam of four Century events by finishing second in San Juan. It's not much satisfaction, but it's all I've got. Sigh...Continuing the baseball analogy, this year looked like a Fenway slugfest with no less than 11 doubles and four triples by the usual heavy hitters: Richard Beyma (A&A, GBG, WAT), Alex Bove (AMR, GOA, RA), Arthur Field (DOM, MFD, STP), and Stefan MeCay (960, POG, TWS) as the race for Caesar/Consul appears to have no shortage of candidates. You'll find a preliminary list of 2010's champions (text version) online now—to be followed in November by our detailed event report pages as only WBC does them. Those interested in the Auction prices will find the list posted online, as well. Attendance set another record in 2010 and that was reflected in tournament participation as well with 16 events drawing triple-digit participation. Although the century mark busters actually declined by one from 2009, there were no less than six events hovering near that mark with attendance in the 90's. The average attendance for the 152 events again rose 2.3 to 51.7, buoyed by 216 players for Liar's Dice and 206 for Ticket to Ride. Despite all that wood gathering, Open Gaming did a banner business—filling the 13,000 sq ft showroom to overflowing—and keeping the ever-enlarging BPA game library humming with happy borrowers. Next year's World Boardgaming Championships will be the 21st anniversary of this reunion of kindred spirits counting back to our roots in the original Avaloncon. We've come quite a ways against long odds, but the future is looking bright thanks to the efforts of over 100 volunteers who contribute their time in varying degrees as Board members, GMs, and behind the scenes workers submitting to a few simple rules to band together for the common good. The point is that we all own WBC and we get out of it only what we put into it. No one profits from this convention or gets paid to run events. We do what we do because we love our hobby and we want to give it substance. We are an organization of volunteers whose combined efforts are greater than the sum of its parts which is a fancy way of saying—here is what You can do to help make next year even better. Regardless of your busy schedule or state of lethargy, I challenge you to find something on the following list you can contribute to the betterment of the next WBC. FOLLOW THE RULES: I don't enjoy patrolling WBC like a stormtrooper but when people are inconsiderate, somebody has to play the heavy. This means do your Open Gaming in the designated Open Gaming area - not in tournament rooms where tables are scarce for the next event. It also means not setting up games and leaving them unattended for hours while others are searching for a place to play. I'm usually not in the mood to put such games away carefully when I'm called to move them and the best sorting pieces can expect under these circumstances is a ceremonial pouring into the box. And you don't want to know what I do to abandoned non-tournament games in event rooms. FEEDBACK: Did you run across an outstanding act of sportsmanship or a great GM performance this year? Tell us about it at conventiondirector@boardgamers.org. From such unsolicited testimonials, we draw the nominees for our GM of the Year, Sportsmanship, and Hobby Service Awards. Reward good behavior—take a moment to single out those who should be applauded for their service. And conversely, if you had a bad experience with a GM that could benefit from some advice on how to better run their event, tell us about that too. GMs don't get better in a vacuum. They need feedback to improve their events and their own performance. We share your input with them and allow you to do so anonymously. SHARE YOUR EXPERIENCES: If you had a good time, don't be reluctant to tell others about it...if not this year, then next. We spend a lot advertising WBC, but it isn't as effective as the many enthusiastic Geeklists that our members have authored for Boardgamegeek since the convention ended relating the fun they had. Out of such testimonials, future gaming partners grow. And that kind of word-of-mouth advertising is often necessary to offset those all too eager to comment on any shortcomings they may perceive. Testimonials tend to be drowned out by the comments about a grouchy bartender encounter, faulty AC, or personal "wanna haves" in the scheduling process so it helps when the positive vibes outnumber the gripes. A number of such reports are already posted to our Publicity page. VOTE FOR NEW EVENTS: Simply by participating in events this year, you helped determine the next Century lineup by pure head count. However, 25 new or "second-chance" events will be determined solely by membership vote in our annual December Membership Drive. By joining the BPA in December you can influence the events that are offered next August. And as a bonus, you'll save money on the cost of registration and get a free full color 2010-2011 yearbook and souvenir t-shirt. Membership also entitles you to free play in BPA email tournaments throughout the year. SUBSCRIBE: Even the most lethargic among you can handle this one. If you are not already receiving our free monthly email newsletters, go to the website address at the end of this message to subscribe and thereby be kept up to date on all the news pertaining to WBC as it happens. PUSH THE ENVELOPE: Not content with the event offerings at WBC? Then do something about it! Our events are run because enough people want to play them, but also because someone got off their duff and volunteered. If you've already done #4 above, then you probably know that every October newsletter announces the call for new GMs to submit event forms for games not run at the previous WBC. Only by doing so in a timely manner, can these events appear on the membership ballot in time for the December membership drive. Got a favorite game that is not played at WBC? Submit an event form in October and correct that omission! And to get you started, Queen Games is looking for GMs/demonstrators for Samarkand, Fresco and others and will provide you with a free copy of the game for doing so. Contact me at conventiondirector@boardgamers.org. VOLUNTEER: Want to get your feet wet before going all out to run an event yourself? Most events are in need of assistants to help sign people in, conduct demonstrations, write event reports, or adjudicate games. Just contact the GM whose address appears beneath each event page on our site to offer your services. Most will gladly accept any and all help. Only when enough people get involved that we don't have the same volunteers pulling double and triple duty will there be any chance to actually increase the number of events at WBC—regardless of the attendance. Many complain about what the schedule does or doesn't do - few actually do anything about it. Be part of the solution! Most of our GMs have been "giving back" to the hobby for years. They could use some help. TURN THAT FROWN UPSIDE DOWN: "Hey, Look whose talking!" I come by my cynicism naturally, but for the rest of you there's still hope! Turn down the testosterone level in those multi-player games, folks—it's only a piece of wood. WBC is about having fun so rejoice in the games and so many kindred spirits to share them with. Befriend someone in Open Gaming and teach them a game. If you're just going to play with your local group, you might as well have stayed at home. Reach out and befriend someone. Disney may be the happiest place on earth but I like to think we can try for the title of friendliest. Finally, for those looking for a little help to attend future WBCs, we are looking for the right individual(s) to take charge of our Open Gaming Room. 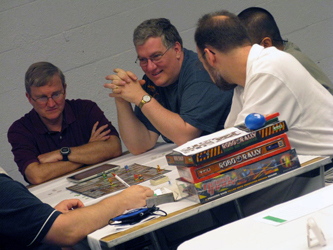 If you are someone who either individually or as part of a small group, could spend your entire week in Open Gaming next year without being distracted by tournaments, etc and can enforce conduct rules and are looking for help with accomodations, contact me at conventiondirector@boardgamers.org.